The UC-Xavier Program is a summer program for undergraduates attending Xavier University of Louisiana. Students can apply via the UCSD XULA program website. 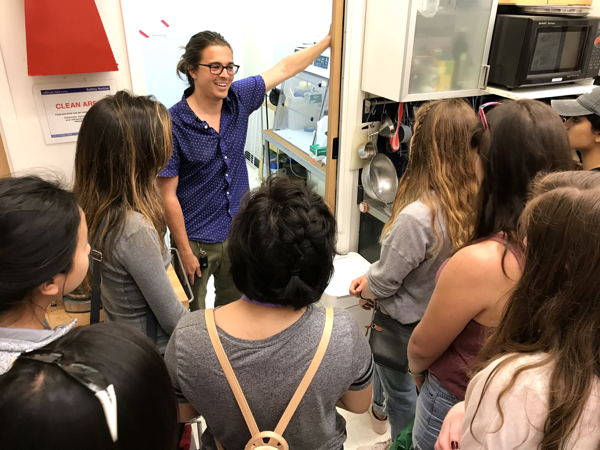 Each year, at least six students will be selected to work during the summer, all expenses paid, in labs within the Division of Biological Sciences and the Scripps Institution of Oceanography at UCSD. Students will also receive graduate prep training and present their research at the end of the summer. Students and their Graduate Advocate from the UC-Xavier 2018 Pilot Program. 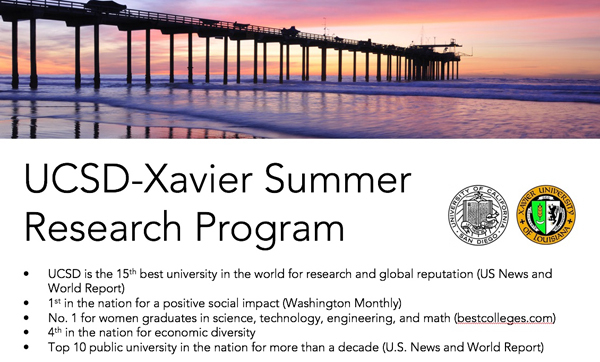 The UC-Xavier Pilot is a summer program for undergraduates attending Xavier University of Louisiana. 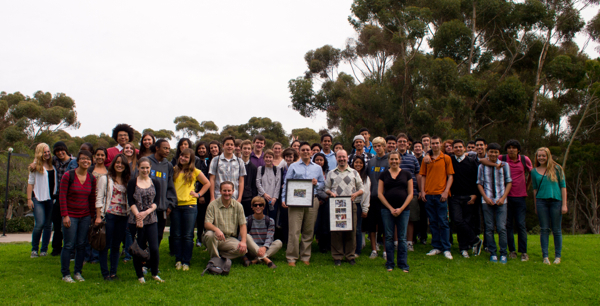 Students can apply via the UCSD STARS program website. 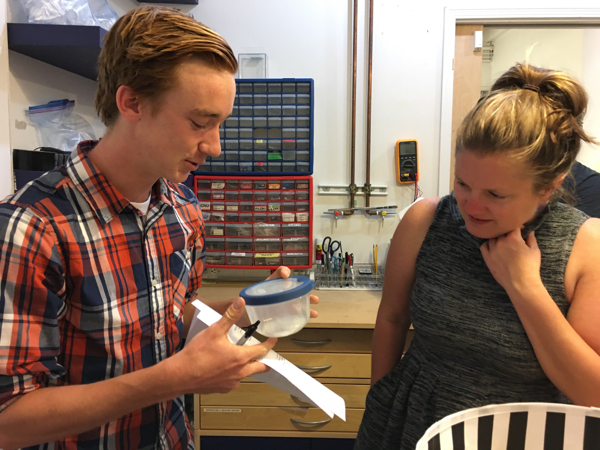 For 2017, four students will be selected to work during the summer, all expenses paid, in labs within the Division of Biological Sciences and the Scripps Institution of Oceanography at UCSD. Students will also receive graduate prep training and present their research at the end of the summer. 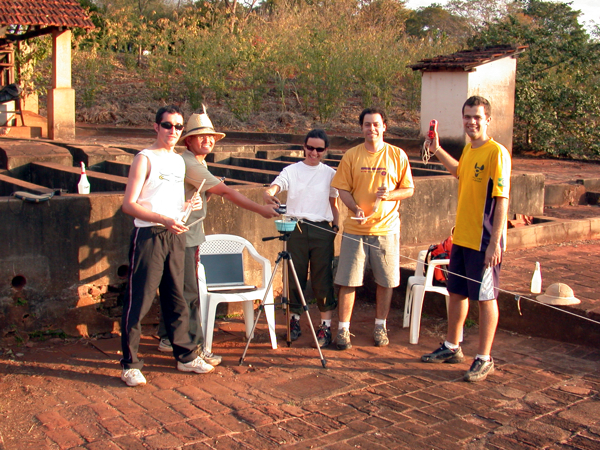 ORBS is a program for undergraduates attending 2-year colleges. Schools currently participating are San Diego City College and Southwestern College. This program encourages students attending community colleges to transition to 4-year institutions and to pursue careers in the behavioral sciences. In particular, we assist students who are interested in transferring to UCSD by familiarizing them with the campus, the faculty, and the educational and research opportunities available. 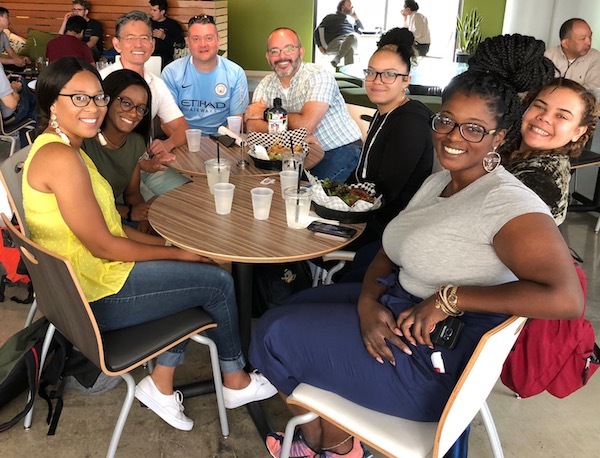 High Tech High is a charter school whose mission is to support and develop innovation in public schools by focusing on how students can make connections between workplace, academic, and citizenship skills. 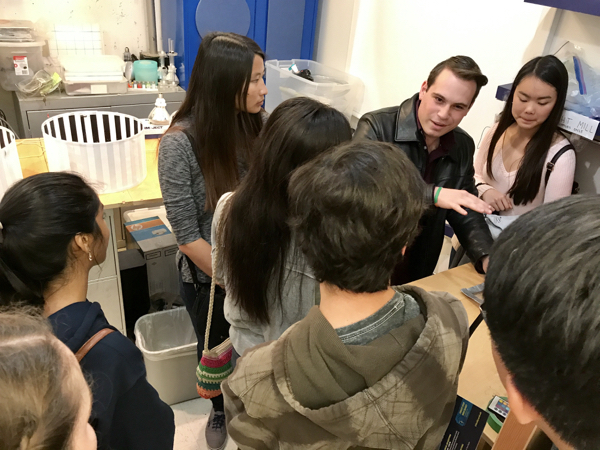 A particular goal of High Tech High is to increase the number of educationally disadvantaged students who succeed in high school and post-secondary education. 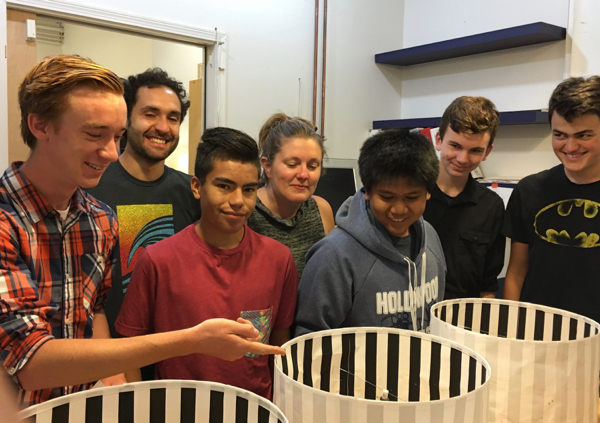 The Nieh lab is pleased to be currently collaborating with teacher Jesse-Wade Robinson to develop greater interest in and knowledge of our native pollinators in San Diego while teaching basic principles about the scientific method and giving students hands-on research experiences. 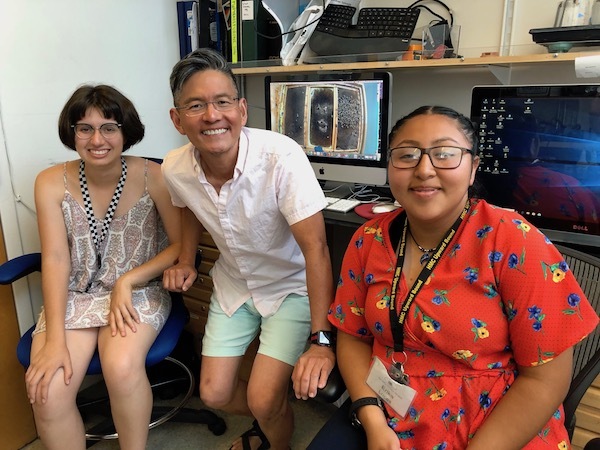 The HMC Upward Bound Program (La Jolla Science Project) provides an intensive summer program combining classes with hands-on internships and research experiences. 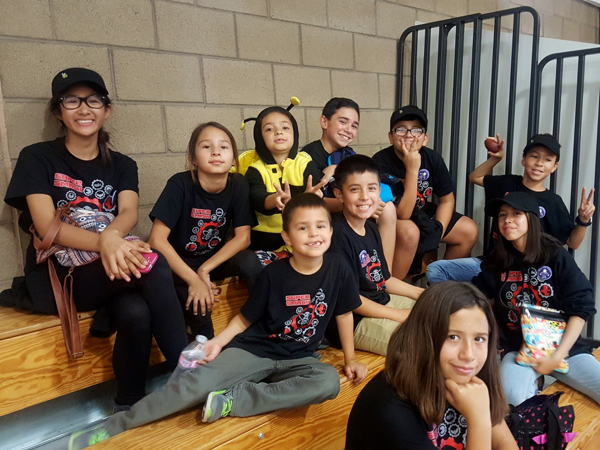 Their goal is to help low income, potential first-generation college students in Los Angeles obtain the necessary skills and motivation to succeed in college. 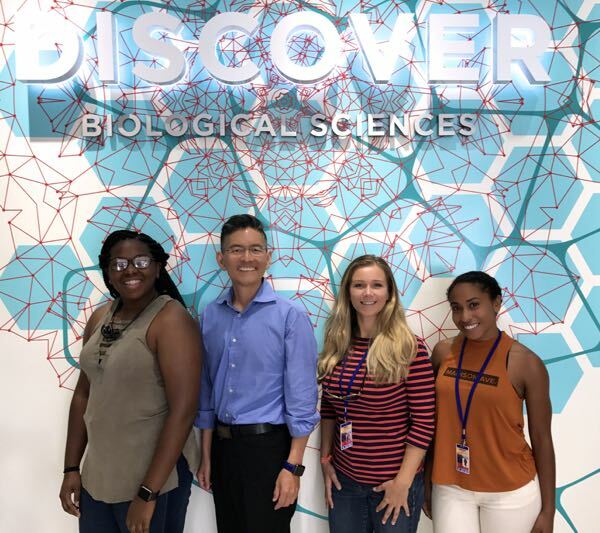 The Nieh lab began working with this program in 2010, and had a great experience with two interns. We will continue working the HMC Upward Bound Program in the summer of 2011. 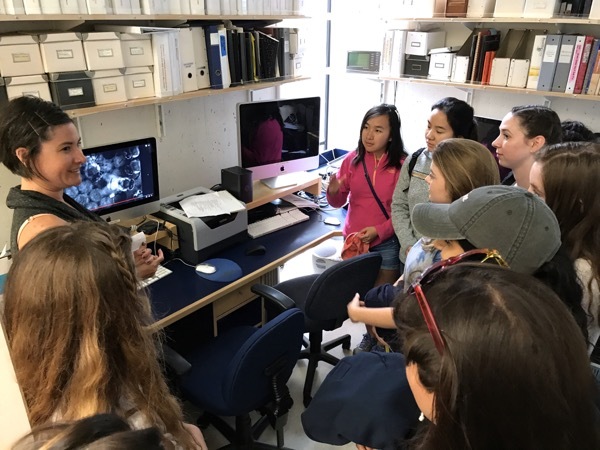 The intensive format of this program (in which students spend approximately 30 hours per week in the lab) facilitates training and data collection and allows students to make real research contributions. The Teaching Bee is where the Nieh lab publishes the exercises and other educational material that we have developed. Our goal is to help teach the scientific method by developing exercises that raise awareness and interest in bee biology. Please also visit the The Teaching Bee's Facebook Group. A beautiful day in La Jolla for the UCSD Xavier dinner celebrating the students’ last week of research (summer 2018). High school students Itziar Burruel de Larranaga and Erika Lucas finishing their summer internships studying bee communication. Itziar is part of the ENLACE summer program at UCSD and Erika is part of the La Jolla Science project. Both programs are teamed up with the Opportunities for Research in the Behavioral Sciences Program. 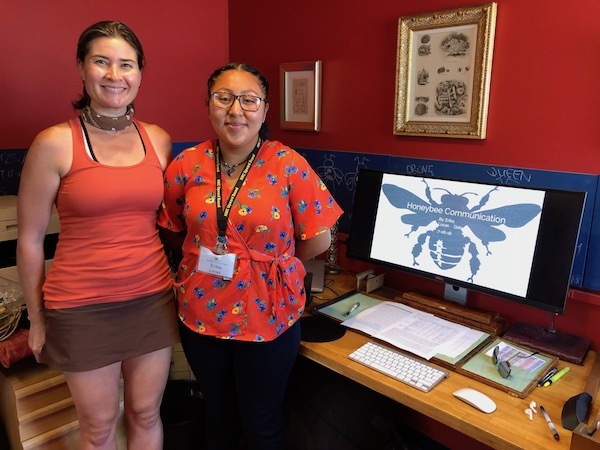 High school student Erika Lucas presenting her research on honey bee communication, shown with her mentor, Dr. Heather Broccard-Bell. 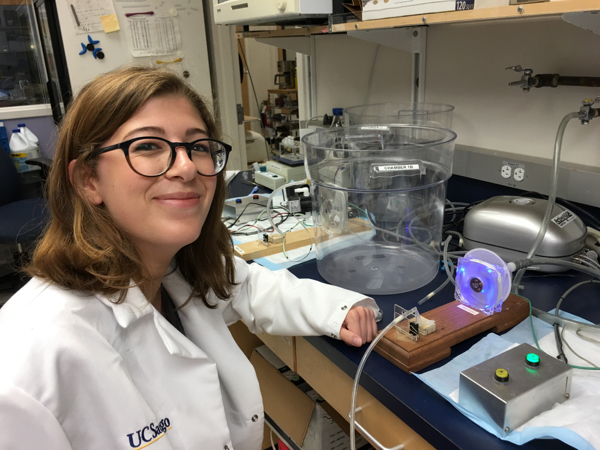 Erika is part of the La Jolla Science project, which is teamed up with the Opportunities for Research in the Behavioral Sciences Program. 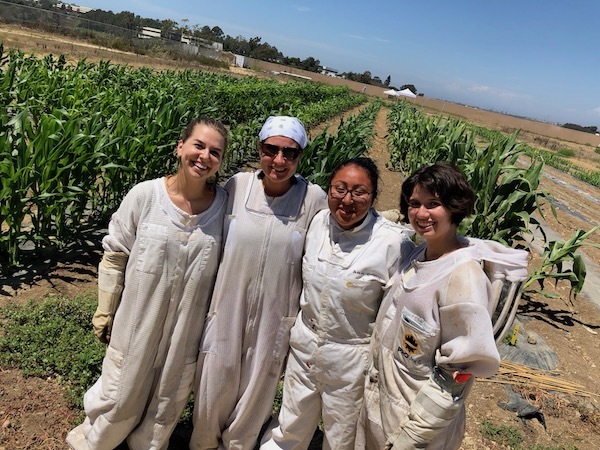 Dr. Heather Broccard-Bell and her team of students (undergraduate and high school) studying honey bee communication this summer at the Biology Field Station. 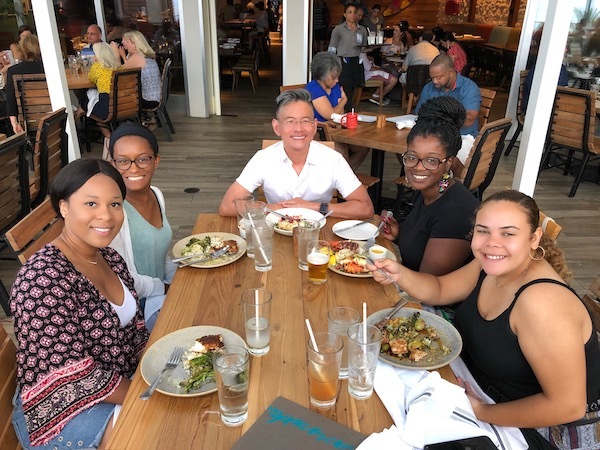 Mentorship lunch with students and visiting faculty from Xavier University of Louisiana (part of the UCSD-XULA summer research program, July 2018). 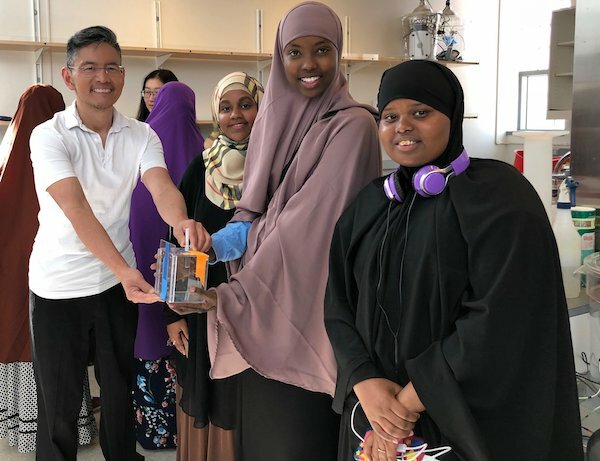 Lab tour for Somali, Ethiopian, and Syrian refugees who are now San Diego high school students (April 2018). 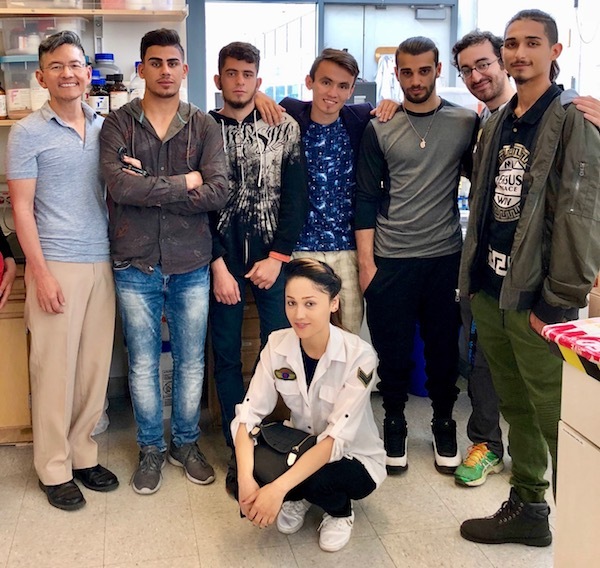 Lab tour for young refugees and asylum seekers from Afghanistan and Iraq, thanks to the International Rescue Committee in San Diego (April 2018). 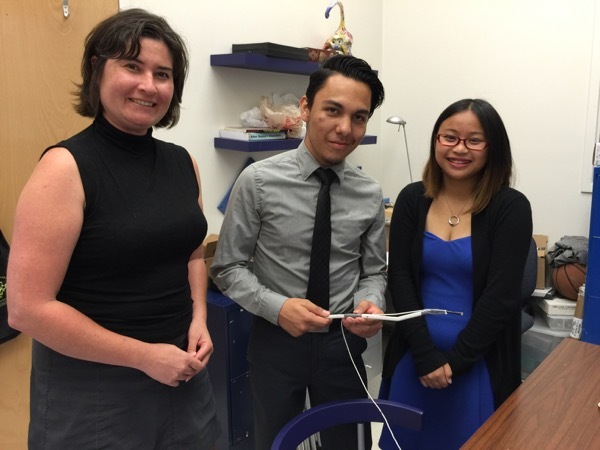 Three students from the 2017 UC Xavier Pilot (June 2017). UCSD MS student, Alex Neskovic, explaining his research on honey bee immunity to prospective incoming students (UCSD Triton Day). (April 2017). UCSD Undergraduate, Joseph Di Liberto, explaining his research on how pesticides affect honey bee flight to prospective incoming students (UCSD Triton Day). (April 2017). 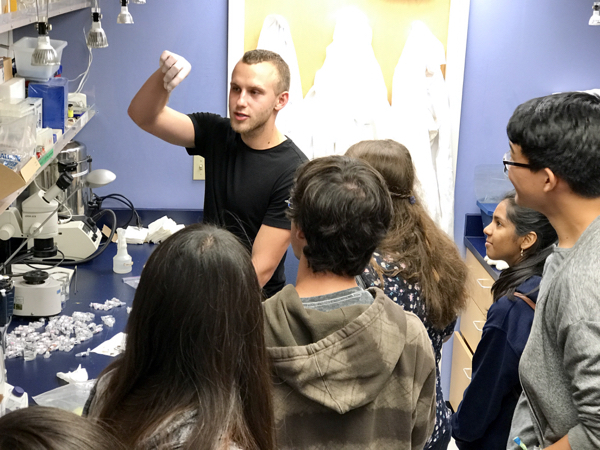 UCSD Masters student, Andrey Rubanov, explaining his research on honey bee immune priming to prospective new UCSD students (UCSD Triton Day). (April 2017). Dr. Heather Bell explaining her research on honey bee communication to potential new UCSD students (UCSD Triton Day). (April 2017). 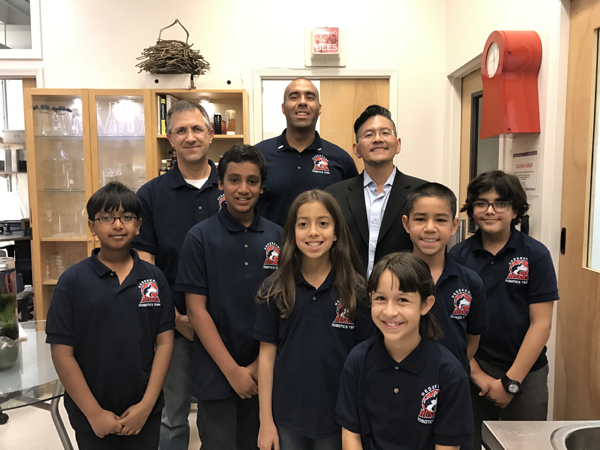 The Hedenkamp Elementary Robotics Team meeting in the Nieh lab to learn about honey bee health and to present their project ideas. (December 2016). 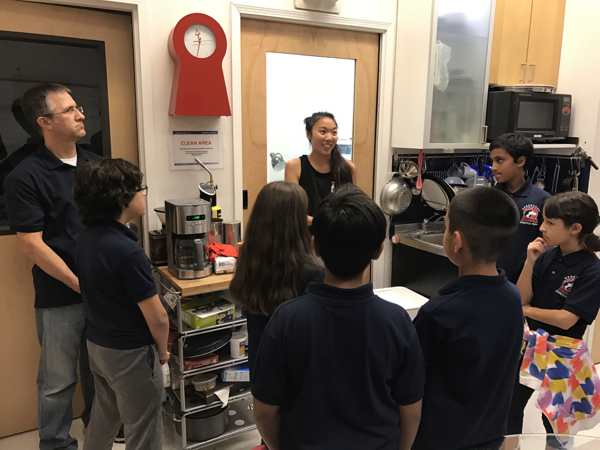 UCSD undergraduate Danielle Nghiem talking to the Hedenkamp Elementary Robotics Team about her research on honey bee health (December 2016). 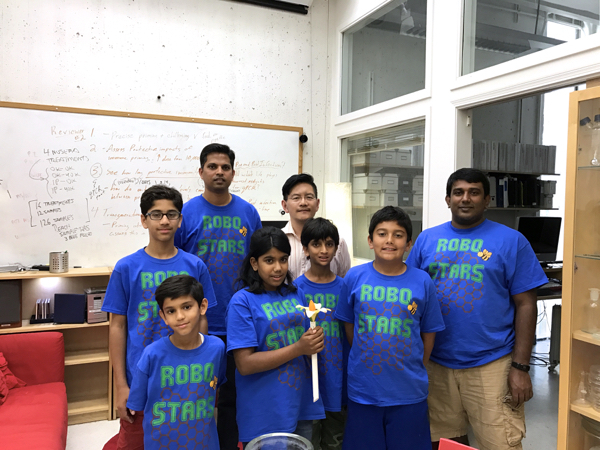 The Supersmashbrobots team that the Nieh lab is helping to advise. (October 2016). 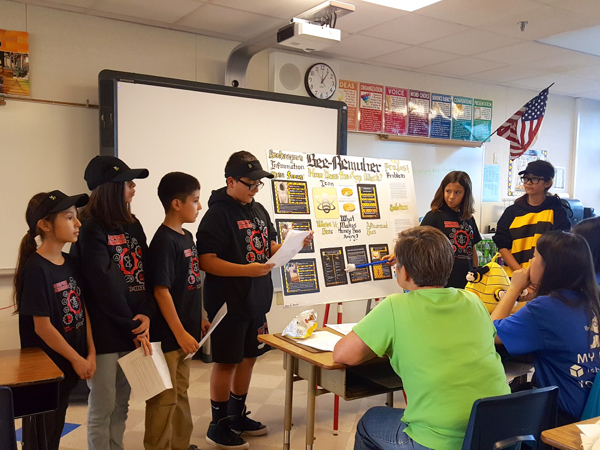 The Nieh lab is working with the elementary school team, Supersmashbrobots, shown here presenting their idea of an informative smart phone app (Bee-Remuber) that provides useful information about Africanized bees and what to do when you encounter bees individually or in a swarm. (October 2016). 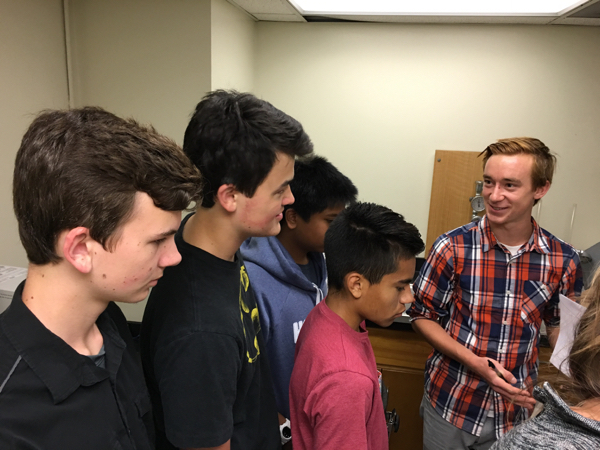 Follow-up meeting with the Robostars students, who presented their ideas and solutions, including a design for a floral-type bee feeder (October 2016). 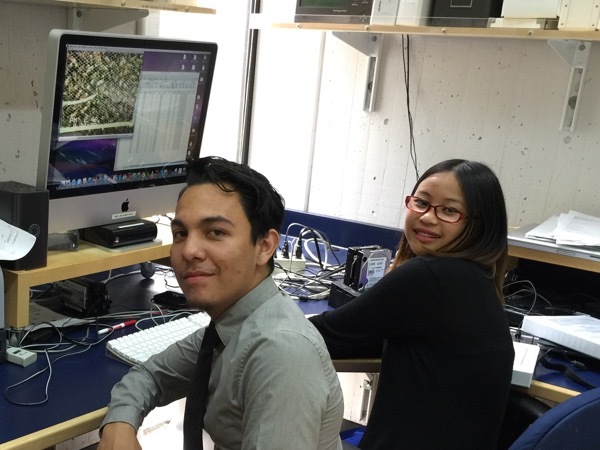 ORBS High School students from the La Jolla Science Project, Valerie Rodriguez (Chaffey High School) and Anthony Alvarez (South El Monte High School) collating data on honey bee inhibitory communication (July 2016). 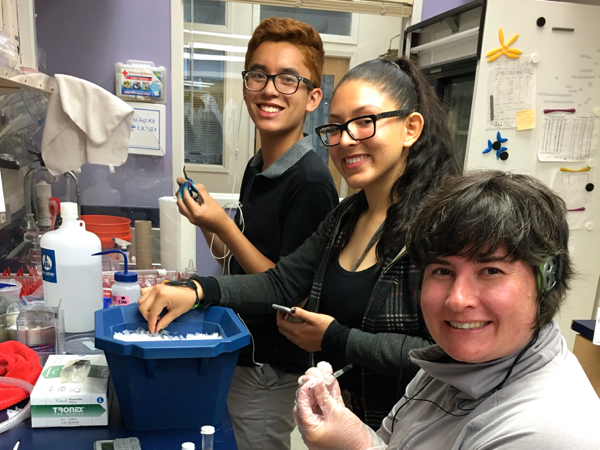 (left to right) High School students, Noah Patarawan (Hilltop High School, San Diego, CA) and Paula Magdaleno (Instituto Mexico, Tijuana, Mexico), working with Dr. Heather Bell via the ENLACE program (see above) to study the effects of pesticides on honey bee olfactory learning (July 2016). 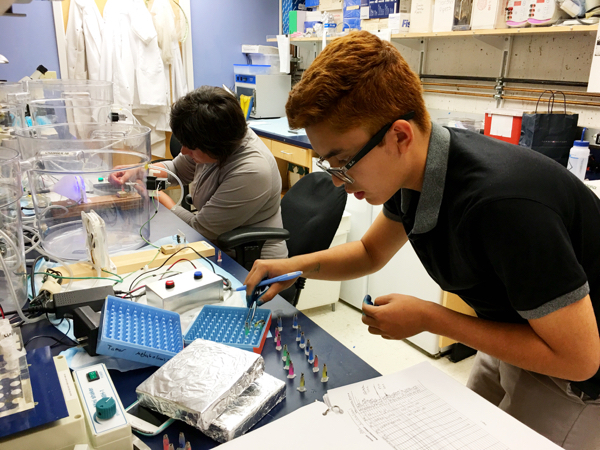 Noah Patarawan (Hilltop High School, San Diego, CA) working with Dr. Heather Bell via the ENLACE program (see above) to study the effects of pesticides on honey bee olfactory learning (July 2016). 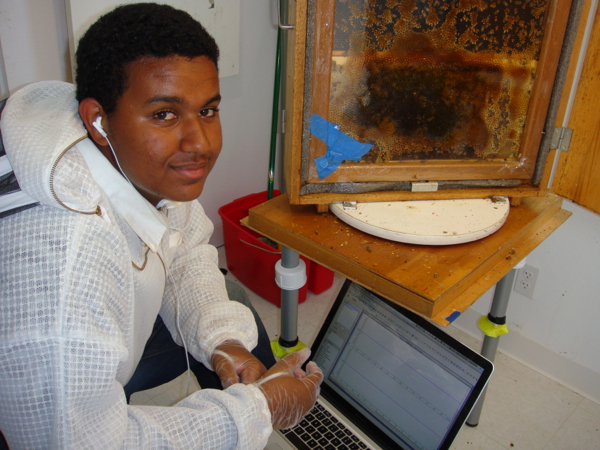 On November 10, 2011, Dr. Eben Goodale and Jesse Wade Robinson, a teacher from High Tech High showed the results of their collaboration in a conference that featured students presenting their research on honey bees. This is the group photo showing all the students who participated. Please see the TeachingBee YouTube site. for detailed videos of the student presentations. 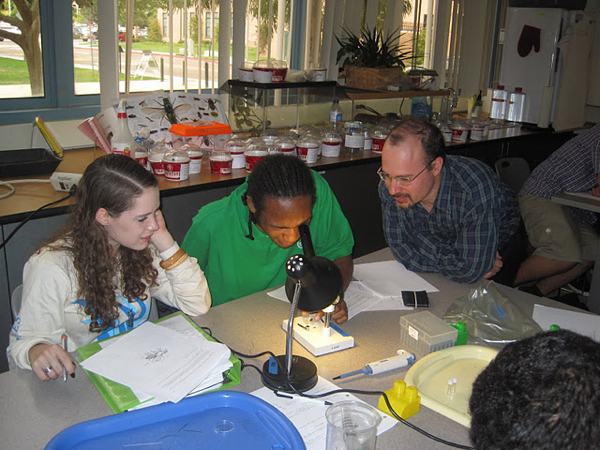 Dr. Eben Goodale shows students from High Tech High how to examine and identify insects under a dissecting microscope. Please see the TeachingBee YouTube site. for detailed videos of the student presentations resulting from this work. 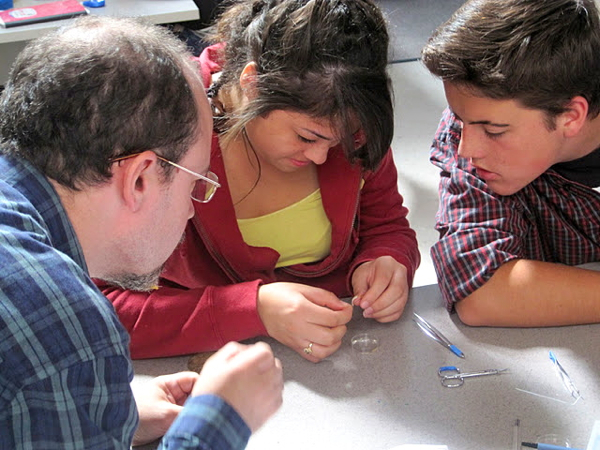 Dr. Eben Goodale shows students from High Tech High how to dissect bees. Please see the TeachingBee YouTube site. for detailed videos of the student presentations resulting from these activities. 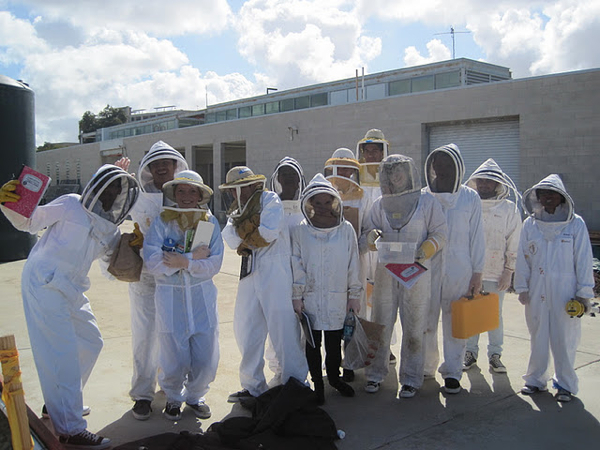 Students from High Tech High dressed up in bee suits to conduct research at the Biology Field Station at UCSD. Please see the TeachingBee YouTube site. for detailed videos of the student presentations of their experiments. 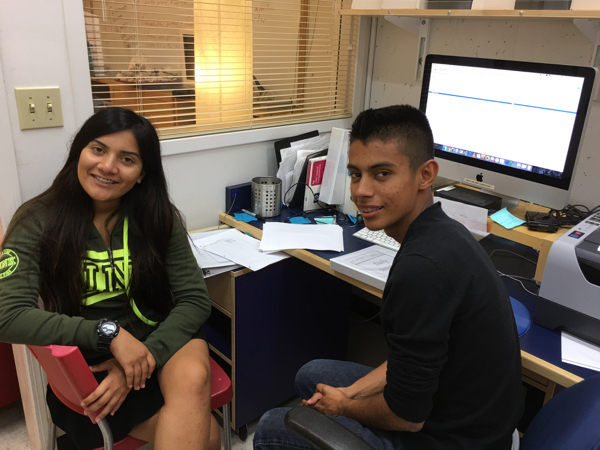 In 2011, we had two great Harvey Mudd Upward Bound Interns, Leonardo Huerta and Francisco Rodriguez, shown here entering in their final data. Thanks guys! 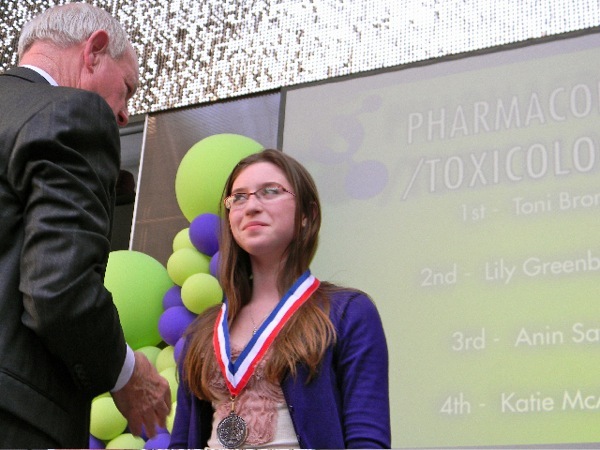 Middle School student, Lily Greenberg-Call, wins second place at the California Science Fair! 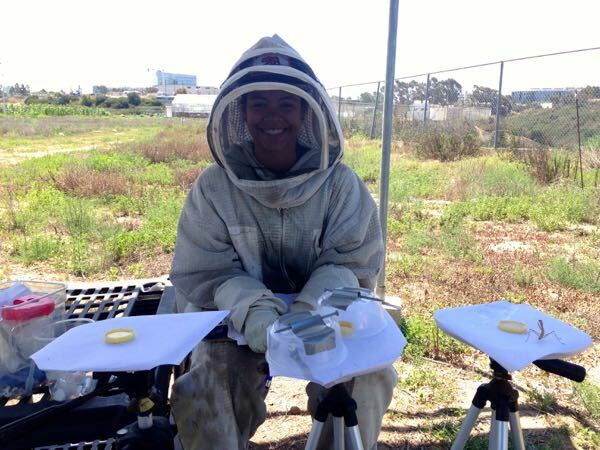 Daren Eiri is her mentor and is currently completing his Master's degree in the Division of Biological Sciences at UCSD on the effects of imidacloprid on honey bees. To learn more about his research, please CLICK HERE. 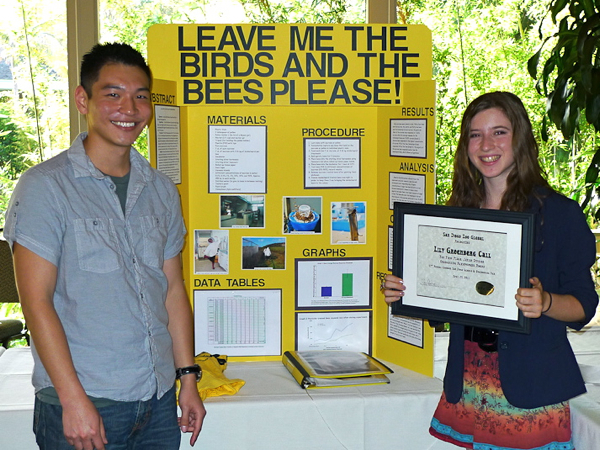 Middle School student, Lily Greenberg-Call, with her poster and first place award for her science fair project (Greater San Diego Science and Engineering Fair) on the effect of the neonicotinoid pesticide, imidacloprid in honey bees. Lily also just received the San Diego Zoo Global Society award and is now competing at the state level with her research project. 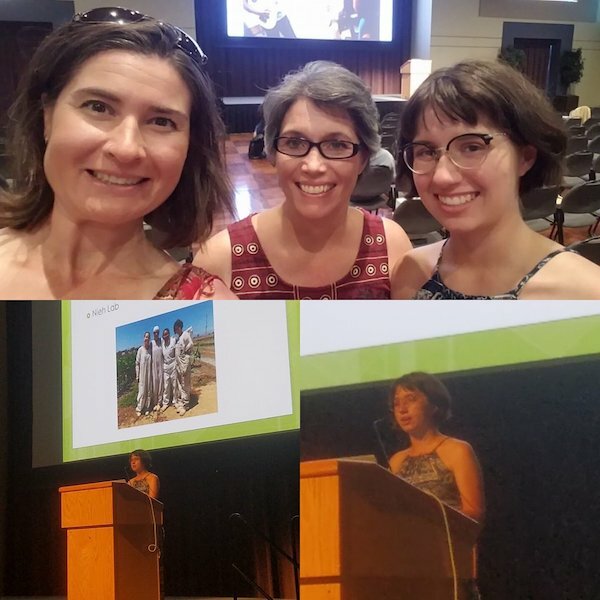 Daren Eiri (on the left) is her mentor and is currently completing his Master's degree in the Division of Biological Sciences at UCSD on the effects of imidacloprid on honey bees. To learn more about his research, please CLICK HERE. 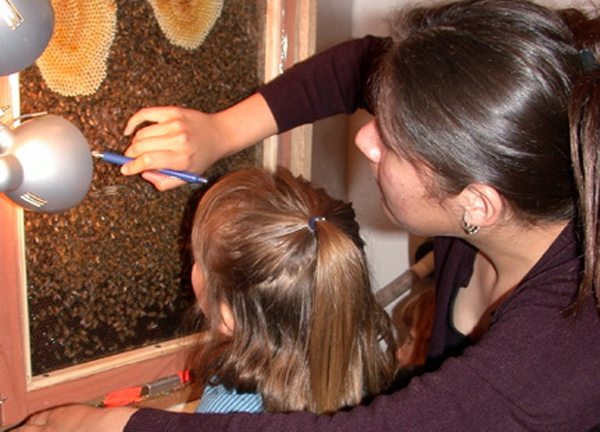 Maria Bernal, former Nieh lab undergraduate mentee in the Opportunities for Research in the Behavioral Sciences Program (ORBS), shows a honeybee observation nest to a visiting kindergarten student from the UCSD Early Childhood Education Center. 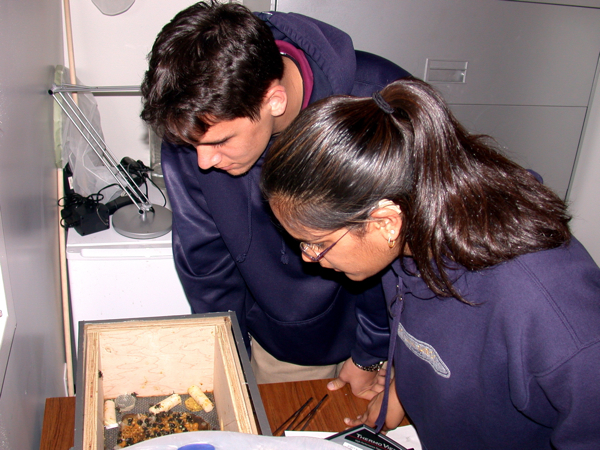 Maria was a student from Southwestern Community College who helped to conduct research in the Nieh lab. David Iaea and Praschila Mistry, former high school students at the Preuss School, which is dedicated to providing a rigorous college prep education for motivated low-income students. 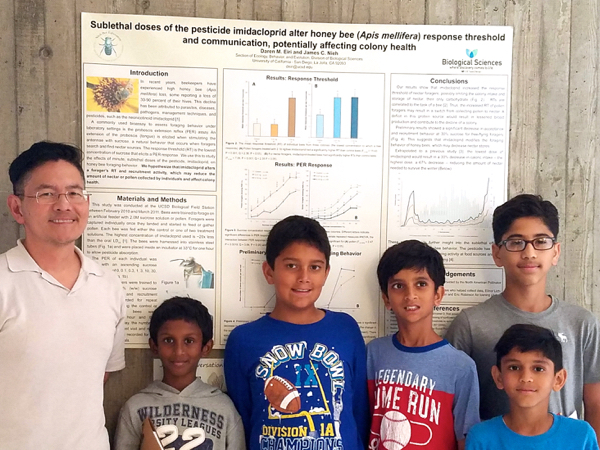 Here they are shown conducting research on the effects of bumble temperature regulation in the Nieh lab. 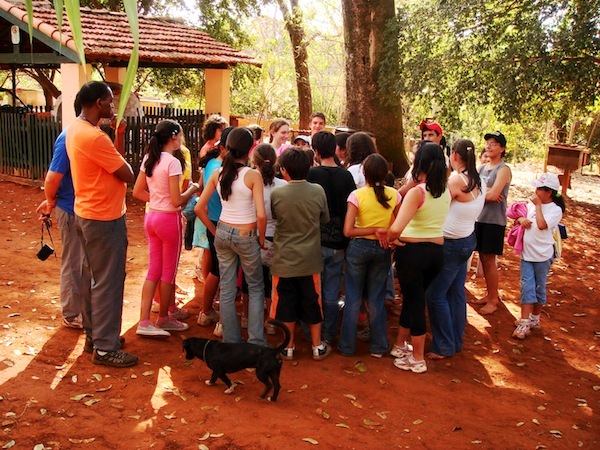 PhD student, Elinor Lichtenberg, talking about native bees to Brazilian students at a ranch where she conducted her research (Fazenda Aretuzina, Bento Quirino, SP, Brazil). 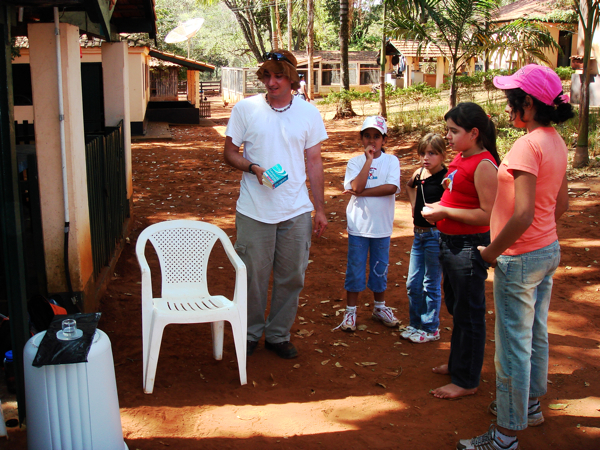 Shawn Kessler, who came to Brazil to conduct research as an undergraduate in the Nieh lab, showing Brazilian students how to train bees to a sugar feeder. Nieh lab members demonstrating research techniques for studying olfactory communication in stingless bees to Brazilian students from the University of São Paulo. Felipe Contrera, former Nieh lab postdoctoral fellow, showing Brazilian students the outside entrances of stingless bee nests. 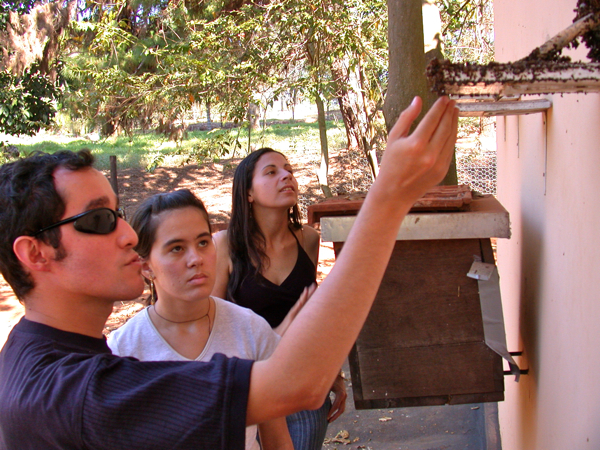 Felipe Contrera, former Nieh lab postdoctoral fellow, showing Brazilian students the observation nests of stingless bees.